Jane Austen’s Emma is the perfect novel. Photo illustration by Lisa Larson-Walker. Image courtesy Wikimedia Commons. “The novel,” Randall Jarrell observed in his essay “An Unread Book,” “is a prose narrative of some length that has something wrong with it.” He was riffing on the Victorian critic John Ruskin, who thought the rule applied to all art, but Jarrell disagreed on that point. Poems and paintings could be perfect, but flawlessness, Jarrell argued, is antithetical to the novel itself. A good novel is art’s closest equivalent to a human being—by nature a concoction of surprises, contradictions, and superfluities. And a perfect human being wouldn’t be human at all. This doesn’t mean that critics and scholars haven’t occasionally decided to declare some book the perfect novel. Two of the most commonly nominated candidates are The Great Gatsby and Madame Bovary. When I was an undergraduate, however, there was a vogue for giving the title to Jane Austen’s Emma. 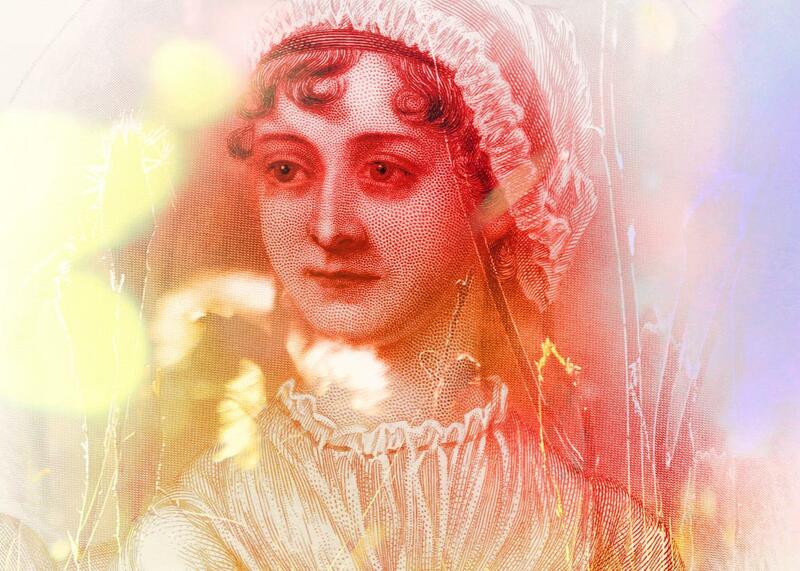 The British essayist Ronald Blythe called it “the climax of Jane Austen’s genius and the Parthenon of fiction.” It’s now more customary to rank Emma as Austen’s “most perfect” book. But given that Austen has a pretty good claim on the title of Most Perfect Novelist—she never published a bad or even a weak novel—and Emma is widely acknowledged to be her masterpiece, calling it her most perfect book is really just a sly way of asserting its supremacy in the form. Why not come right out and admit it? Emma, which was published 200 years ago today, is indeed the perfect novel. Yet many Austen buffs prefer other of her novels, either Pride and Prejudice, the popular choice, or Persuasion, the worldly one. Perhaps that’s because the perfection of Emma strikes these ardent readers as a bit chilly, or perhaps it’s because Emma is Austen’s least romantic work. Pride and Prejudice is about the capacity of genuine love to transcend barriers of class and personal failing, and Persuasion is about the possibility of snatching last-minute happiness from a life damaged by a major mistake. Emma, by contrast, wants to inform us that we are less clever than we think—and that we are prone to making a mess of things until we accept this truth. Before Emma was published, Austen worried that she would be the only person to like her heroine. Emma Woodhouse, age 20, is, as the opening sentence famously proclaims, “handsome, clever and rich,” and if that weren’t bad enough, she is also rather spoiled and a snob. But Emma is also witty and fundamentally kind, and more readers than Austen ever anticipated have been willing to give her the benefit of the doubt as she blunders and repents her way into a better character. The novel follows Emma’s evolution, in about the course of a year, from a misguided girl to a woman of both sense and sensibility. The action takes place entirely in Highbury, a small town in Surrey. This setting provides what Austen described to her niece as “the delight of my life—2 or 3 families in a Country village is the very thing to work on.” In more than any of her other novels, however, the town becomes a speaking presence, with its collective opinion often remarked upon: “Mr. Frank Churchill was one of the boasts of Highbury, and a lively curiosity to see him prevailed.” Stupid people sometimes complain that the limited, provincial settings of Austen’s books and the entirely personal matters that concern them make her novels trivial or ephemeral. While there is not much point in debating with the stupid, it is worth noting that nothing is more eternal and universal to the human condition than the society of a small town. Adjust for variations in customs, possessions, and manners, and they’re the same the world over, from China and Africa to rural Maine. In fact, the constrained scope of Emma surely contributes to its perfection. Its structure is ideally proportioned and functions as precisely as clockwork. There isn’t a paragraph in the novel that fails to contribute to the overarching purpose of maturing Emma and conjuring Highbury—from Ford’s, the general store, to the “inconsiderable” Crown Inn to the apartment where the prattling Miss Bates lives in genteel poverty with her deaf old mother. Furthermore, most of the novel’s elements do double or even triple duty. As the mystery novelist P.D. James has pointed out, Emma is a prototype of the detective novel, in which several of the characters harbor concealed motives and plans. Some of these secrets are invisible primarily to Emma herself. Convinced that she has engineered the marriage of her beloved onetime governess to a local gentleman, she decides to “make a match” between her naive young protégée, Harriet, and the vicar, persuading the girl to rebuff a farmer who truly loves her. But the vicar—a fawning climber—proposes to Emma instead. This disgusting development comes as a surprise only to Emma and to her gullible, and now heartbroken, friend. That’s the first volume of the novel’s three volumes (most novels of the period were published in this format). The remaining two describe what happens when two new visitors come to town, and Emma’s imagination kicks into overdrive. The first time through, the reader is as likely to be deceived by appearances and assumptions as Emma is. Emma is a novel that repays multiple re-readings; the second time around, the clues that Austen masterfully planted suddenly pop. But no need to stop there; as John Mullen recently wrote in a splendid tribute to the novel for the Guardian, he is still discovering “tricks” in Emma—such as the function of Mr. Perry, the apothecary of Highbury, a figure often invoked but never allowed to speak for himself—after multiple readings. Mullen argues that not only was Austen supremely accomplished as a novelist, but she was also daringly innovative and “experimental,” terms not often associated with her. Yet he insists, and persuasively so, that Emma constitutes the first use in English fiction of what we now call free indirect style. This is a third-person narration limited by what the point-of-view character sees and believes. (Perhaps the most popular contemporary practitioner of this technique is George R.R. Martin who presents the events of each chapter in A Song of Ice and Fire through the eyes of one of several characters.) We see the world of Highbury almost entirely from Emma’s perspective, filtered by Emma’s judgments. While it’s sometimes possible in spite of this to discern what’s really going on—such as the true object of the vicar’s matrimonial ambitions—when outright deception conspires with Emma’s own blind spots, Austen’s readers can be as easily led astray as her heroine. when the insult came at last, it found her very differently affected. [Her good friends at] Donwell and Randalls had received their invitation, and none had come for her father and herself; and Mrs. Weston’s accounting for it with “I suppose they will not take the liberty with you; they know you do not dine out,” was not quite sufficient. She felt that she should like to have had the power of refusal; and afterwards, as the idea of the party to be assembled there, consisting precisely of those whose society was dearest to her, occurred again and again, she did not know that she might not have been tempted to accept. Harriet was to be there in the evening, and the Bateses. They had been speaking of it as they walked about Highbury the day before, and Frank Churchill had most earnestly lamented her absence. Might not the evening end in a dance? had been a question of his. The bare possibility of it acted as a farther irritation on her spirits; and her being left in solitary grandeur, even supposing the omission to be intended as a compliment, was but poor comfort. This little passage, written in a style very close to Emma’s own speech, is both very funny and very true, but not at all mean or cynical. It conveys that class relations in the backwater of Highbury are changing, but more importantly that Emma’s resistance to that change, and her attachment to her advantage in status, will only make her lonely. Austen shows that her heroine’s worst behavior and attitudes go against her better nature, which is convivial and loving. Soon, one of Austen’s greatest comic creations will arrive in Highbury: Mrs. Elton (the new wife of the aforementioned vicar), who besides being deliciously awful, will further press this case by presenting Emma with a cautionary reflection of her own snobbery—all while supplying Austen’s readers with endless amusement. Comedy always imposes some distance. Austen is not obliged to take her heroine terribly seriously, and the perennial question of whom she will marry feels less than passionately urgent. If Elizabeth Bennet loses Mr. Darcy or Anne Elliot loses Captain Wentworth, the results will approach tragedy, but Emma will be fine, and knows it. “I shall not be a poor old maid,” she happily assures Harriet, “and it is poverty only which makes celibacy contemptible to a generous public!” Yet Austen does love Emma, who is surely the closest of all Austen’s characters to her creator in temperament, wit, and imagination (if not in wealth). The presiding message of the novel is that we must forgive Emma for her shortcomings just as she can and does learn to excuse the sometimes vexing people around her. There is, I believe, more wisdom in that than in many, many more portentous and ambitious novels. Emma is flawed, but Emma is flawless.